The Commlog is a general purpose log of all communications with a patient. In the Main Toolbar, click Commlog. There are several additional ways to manually start a commlog. A log of all commlog entries show in the Account Module, Chart Module, Edit Appointment, and Recall List. Changing status on the Recall List. Types: The options that show are those listed in Definitions: Commlog Types. In some areas of Open Dental, a commlog's default type is set based on where the commlog is created. Set the default type in Definitions. APPT: The default commlog type when Comm is clicked on the Edit Appointment window. This type will also be highlighted yellow in the Communications Log area, making it easy to see appointment commlogs at a glance. RECALL: The default commlog type when commlog entries are entered from the Recall List. MISC: The default commlog type when commlog entries are entered via the main toolbar. Type does not affect sorting of commlogs. Mode: The method of communication. Auto Note: Add Auto Notes to the commlog note text. Clear: Clear contents of commlog note. Note: The commlog text. Once a note is added to a new commlog, you must click OK to save or Delete. Commlog entries support Electronic Signatures. Sending text messages or printing postcards from the Confirmation List. 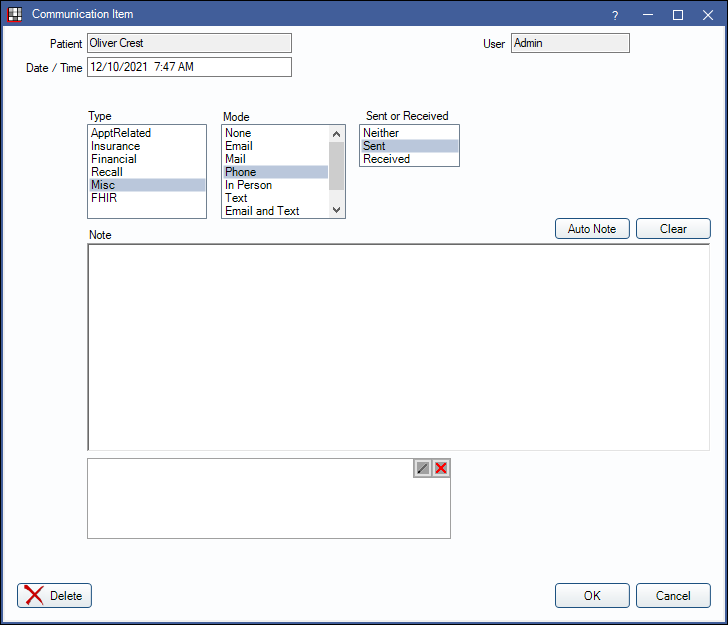 Statements: Every time you print a statement, a commlog entry with a type of Statement Sent is generated automatically and shown as a line item in the patient's account. These entries do not show in the Communications Log list. Auto Save: New commlogs in progress can be set to auto save on a 10 second timer, if a change was made in that time. Auto Save is only available for newly created commlogs. The date and time in the window header shows when the commlog was last saved. Enable the Commlogs Auto Save preference in Account Module Preferences. With or without the preference, commlogs in progress are automatically saved when Open Dental shuts down unexpectedly (e.g. during an update).